Outdoor sips and eats are coming to the heart of Philadelphia’s business district. 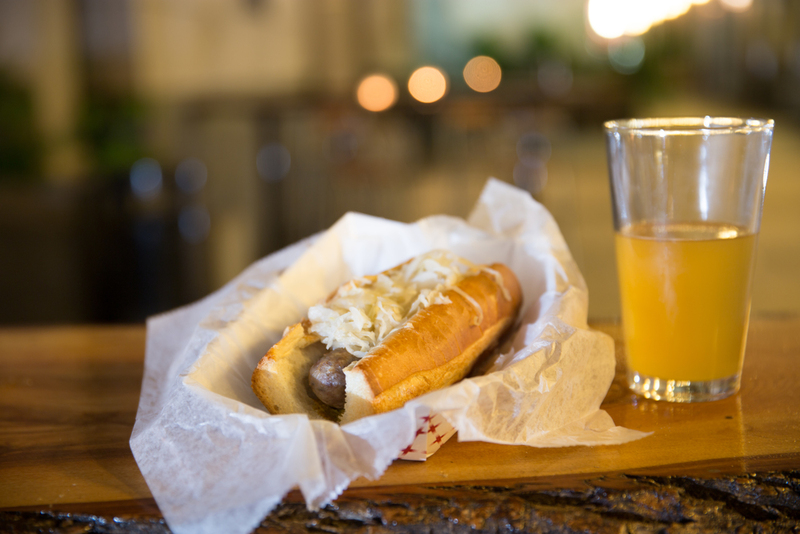 BRU Craft & Wurst announces the opening of Uptown Beer Garden at 1735 JFK Boulevard in the courtyard of the PNY Mellon Bank Building on Wednesday, July 1, 2015 at 4:00pm. The 9,000 square foot summer pop-up will run through September and feature picnic tables, granite benches, tree slab communal tables, outdoor lighting and rustic decor in the tree-lined courtyard. A 35-foot bar will feature a full selection of spirits, select wines, six craft drafts and nearly a dozen craft cans. Signature cocktails will include frozen margaritas, stone fruit and berry red sangria, and peach and apricot white sangria. The on-site kitchen will serve a selection of bar snacks, sliders, sandwiches and even dessert. Starting hours are Monday, Tuesday and Thursday 5:00pm to 10:00pm, Wednesday 4:00pm to Midnight, Friday and Saturday 2:00pm to Midnight and Sunday closed. A portion of proceeds from Uptown Beer Garden will be donated to Philadelphia Animal Welfare Society (PAWS). For more information, call BRU at 215-800-1079, visit BRU Craft & Wurst on Facebook and follow @bruphilly on Twitter. The Uptown Beer Garden can host up to 500 people and will feature $5.00 and $6.00 (average) craft drafts and cans, seasonal cocktails, bar bites, sandwiches and dessert. The main entrance to Uptown Beer Garden is 1735 JFK Boulevard. The garden will also be accessible from the Market Street side through a passthrough next to the PNY Mellon Bank Building. Happy hour specials will run Monday through Saturday from 5:00pm to 7:00pm, and include $3.00 beer and $5.00 Wurst sandwiches. On Wednesdays, look for extended hours (4:00pm to 7:00pm) and additional specials to coincide with Center City Sips, including $5.00 cocktails, $4.00 wine, $3.00 drafts, and half-priced select appetizers. Other events and promotions will include a Yappy Hour and a pop-up with Philly Phaithful’s new Philadelphia Experience collection (details on both coming soon). For more information, call BRU at 215-800-1079, visit BRU Craft & Wurst on Facebook and follow @bruphilly on Twitter.